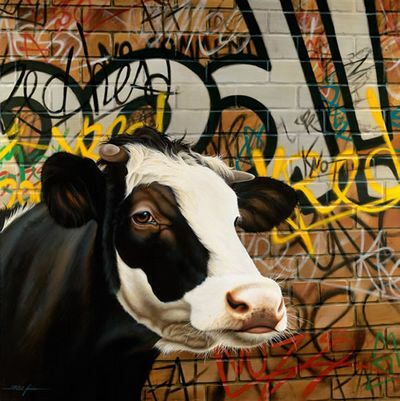 Artist Paul James – Where Urban Meets Farmyard!!! Paul James was born and raised in Leicestershire, where he grew up with a natural talent for art. Encouraged by his parents, he progressed artistically & with the advice of his school teachers, went on to art college to study graphic design. Paul did not complete his course & instead began to sell paintings of vintage cars and neighbours petsâ€¦more on his artistic journey in a later post! 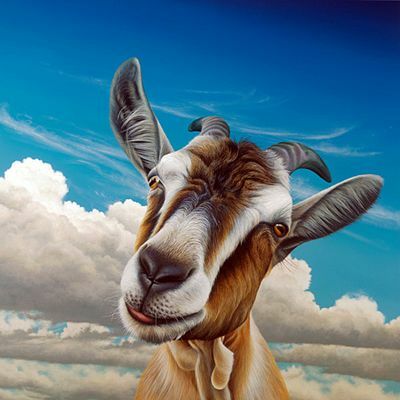 You may be surprised to hear that Paul James is also a self-taught artist, as he is so incredibly talented you may not necessarily link those two statements! 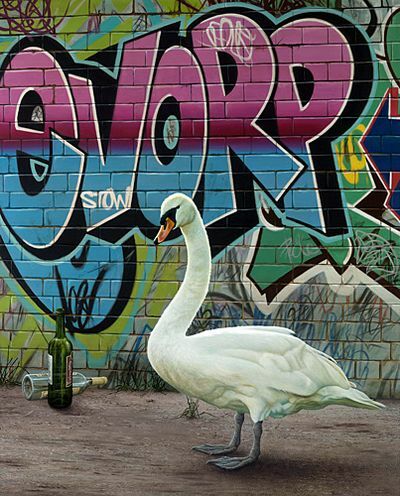 Paul is known for his very realistic, almost photgraphic looking paintings of animals and landscapes. 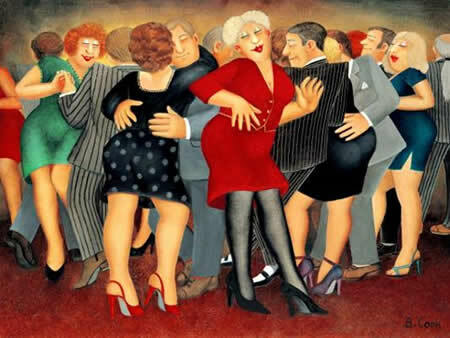 His artworks have gained him a big following in both the UK and overseas such as the USA & Ireland to name but two and it is not hard to see why. His uncanny ability to paint animals in fascinating detail and capture amusing poses & expressions has endeared him to the public. Paul has had the amazing success and honour of being published by not one, but several different publishing houses during his career, which just goes to show his continuing popularity and the first class art he is producing. His art takes a great deal of time to paint & we can see this in his great attention to detail, the subtle colours in the animalâ€™s coats & the way you can see each separate animal hair in places! A little known fact about Paul is that he is also a very talented musician and composer, he has even released a CD of his music, as well as performing for live audiences. Now that is what I call multi-talented! 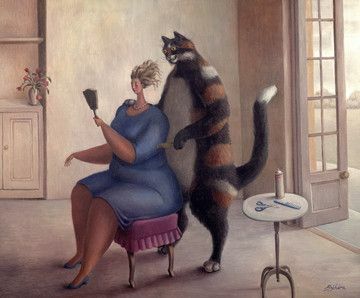 Although, it would not be hard to guess that Paul is an artist of many talents due to the versatility of his art, the fact that he can paint a serious picture of a landscape on the one hand and then a humorous animal the next. Paul was previously published by Washington Green Fine Art publishers. New For Winter 2010 Paul is now being published/distributed by Demontfort Fine Art publishersâ€¦again we will have more on this in a future post! Good news Szikora fans!!! 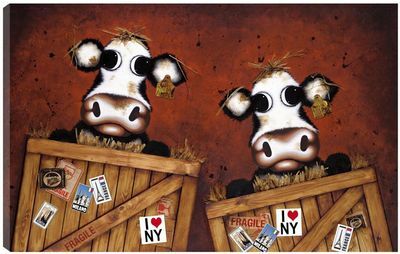 More new art from Sarah Jane Szikora, one of the UK’s best loved humorous artists!! Yes, more gingerbread people, more fat ladies and more crazy humour is in store for you!! 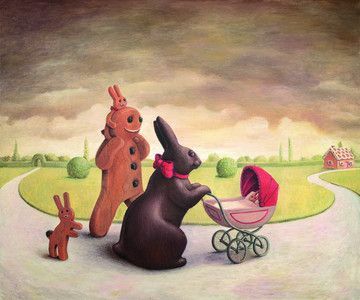 As well as this piece we have “Home Sweet Home” where we have a family; a gingerbread man and a chocolate bunny! And they have some mixed-race children. That is to say, the children are gingerbread with *ahem* bunny ears and a bunny tail!!! Szikora will never cease to amaze us I’m sure! I donâ€™t want to bore you with descriptions of her art when you can see it for yourselves but you really must see it, her sense of humour is amazing, if a little nefarious at times. Blushing Dolls is really amusing once you realise whatâ€™s so funny about it. For me, it took several glances at the picture until I clocked it! 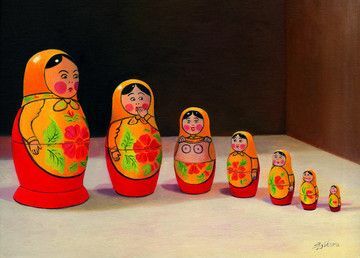 What is a Russian Doll? Exciting news Caroline Shotton fans! She has released some new art again! These pieces available to preorder until the end of March/beginning of April when the art will be officially released but by this time some of the pieces will have already sold out!! 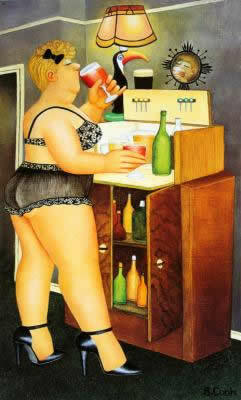 Thatâ€™s how hot Caroline Shotton is right now. 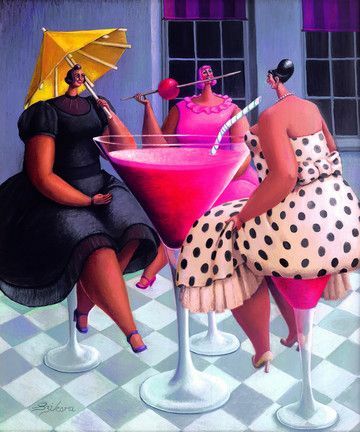 There are five new pieces, some following on from previous popular themes and colours; all have humorous titles, like all of Caroline’s previous limited editions. 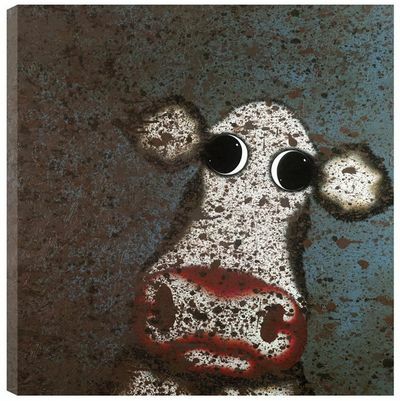 We expect â€˜On the Moooveâ€™ to be very popular as it themed similarly to previous releases “Handle With Care” and “Special Delivery” which sold out very quickly indeed. 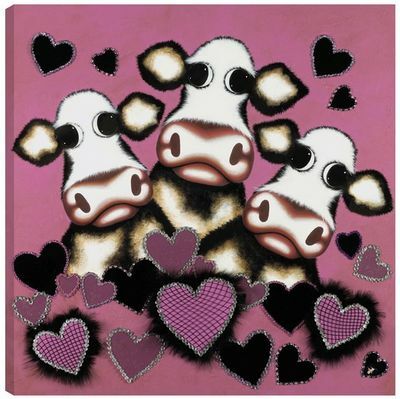 Also â€˜So In Love With Mooâ€™ has the same colour themes (red) as “I Give My Heart To Moo” and her four Autumn 2008 releases including “Moo Too” & â€œTwo & A Calfâ€ we expect it to be just as popular! Caroline’s art has been ridiculed by art critics in the past & yet she continues to show that the opinion of the art buying public & not theirs is paramount. Kind hearted, she has previously released art for charity and today most of her art sells out within weeks of publication. 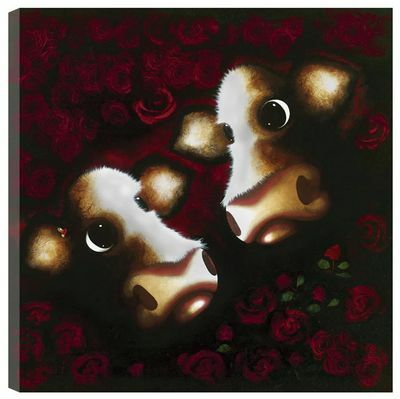 I believe it is the mixture of her signature endearing cows, humorous titles & all her limited editions being hand-embellished (making them as close as possible to the original) that make her art so unique and collectable with the British public. Added to the fact that we Brits have a natural affinity to the countryside and to the idyllic image of the English countryside that the diary cow is part of.